Jamiedidit: Things Will Be Great When You're DOWNTOWN! Things Will Be Great When You're DOWNTOWN! So. As of today, the Todd and I have been together for seven years. Granted, there was a breakup in there if you are being technical, but who likes technicality in matters of the heart? So, seven years. Wow. That’s longer than quite a few marriages I could name. We’re like Goldie Hawn and Kurt Russell, except with much less collagen and no Academy Awards. Did you know Goldie Hawn won a Best Supporting Actress award in 1969 for her role in Cactus Flower? From Laugh-In straight to the Oscars in one fell swoop. Now that is what I call a good career trajectory. And she gets Kurt Russell out of the bargain, and any man who voiced the lead character in a major Disney film (The Fox & the Hound’s Copper) would win my heart, too. Anyway, Kurt and Goldie have been together since 1983, so they have a good twenty-six years on the Todd and I. Let’s not look too far ahead, though, because it makes me nervous. Last weekend, the Todd was home for the first time in three weeks and we decided to celebrate our anniversary a bit early. This was a serious, serious decision. We are, perhaps not “foodies” because that carries sort of a food snob connotation, but most definitely food lovers. You would not think our tiny little town would have much of a choice between restaurants, but you would be mistaken. Our Main Street area has five great, great little places to eat. Ou’ La La, where I recently hosted the baby shower for Nicole and Amelia, is a sweet little coffee shop with a killer dinner menu as well – often featuring the fabulous Tessa playing with Main Street Trio. C’Sons is a brand new place across from Ou’ La La. It’s all new and sparkly and the menu changes every day. And they have this fun covered porch balcony thing that makes me feel very L.A. Then, of course, our friend Tulla has not one…not two…but three restaurants, all with different specialties, all within walking distance from each other. Tulla’s Bayou Bar & Grill is (obviously) all about spicy Louisiana food. Venucci, Pete’s favorite, is all Italian, from the Chianti to the Cannoli. Finally, The Basil Leaf, the flagship restaurant, is billed as Upscale Contemporary. I mean, really, how does one choose? Y’all. You just don’t know. We both wanted to get really dressed up, but his idea of dressed up and my idea of dressed up varies a bit. Example: at Chuck the Girl’s wedding, I had to be onsite early, as I was giving a reading. So after the wedding, all the guys took off their jackets because the reception was outside. The Todd kept wearing his…buttoned…way longer than he normally would have worn it. I knew something was wrong. “Dude, it’s hot. The guys are all playing football (Note: That’s right, we played football. It was the greatest wedding ever.) and you’re sitting here all sweating. Ladies and Gentlemen, nothing says dressed up like a belt emblazoned with the Grateful Dead bears. So we both dressed up – somewhat equally – and went out on the town. It was great. I had Wild Mushroom Ravioli with a red pepper coulis and all sorts of yummy goodness cooked within. The Todd had the Fried Alaskan Halibut with, I think, claw crabmeat, hollandaise sauce, grits and asparagus. I hate stuff that swims, but he said it was pretty much awesome. We were seated at a low table, which was really good, as the Todd was rocking his skateboard shoes with dress pants and a tie. This is how we roll, peeps. It was fabulous. After dinner we walked around downtown on a useless hunt for Tiramisu. Venucci makes a killer Tiramisu, but it was sadly not on the menu that night. So we settled for a stroll around the square and an ice cream cone. There was supposed to be a post-dinner showing of Harry Potter and the Half Blood Prince, but we were just too full to watch it! We postponed Harry until Sunday and, now that I have seen it twice, I have some serious bones to pick with that screenwriter. But I will wait on that, for the moment. All in all, it was a lovely evening, and has been a lovely seven years. And will, I hope, continue to be just as lovely, because I can think of several more restaurants that need to host our anniversary dinners. Confession: I am too young to know that those Greatful Dead bears are in fact Greatful Dead bears and not a gay symbol...I thought they were just another among the many rainbow colored things. 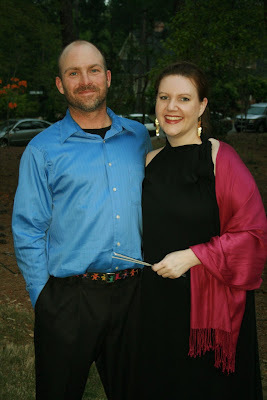 I LOVE this blog - fancy dinner and you look smokin. THAT is HILARIOUS! I LOVE the Grateful Dead belt story!!! Classic. Love you and all of your fab story telling! Hey - thanks buddy! D-Rams has done a lot for me. When I grow up, I want to be just like Dave (except with all my hair...). Don't hate on the octopus.